When you are redesigning a room in your home or outfitting a newly built house or flat, one of the points to be considered is the floor. Now there is a great variety of flooring materials. Visual appearance of the wooden or laminate floor is excellent or at least good. Quality floors last for a very long time that makes such flooring preferable and desirable option but beside the great appearance durability, and installation, there is always a money question. It might be a great deal for you to calculate the preliminary cost of the flooring materials you need, before you start realizing your flooring project. In this case, our hardwood flooring calculator will greatly assist you. You have to be aware that you will get only approximate figures and it is better to add 10% extra to avoid you are shortage of materials when you are in the process of installation already. As you may suppose, you have to take into consideration different factors like what type of the flooring you would prefer, the amount and price of the selected option, you also have to know what type of materials are to be laid as a subfloor and the price of it, and the size of the area to be covered. It is good if the measurement of the area size is precise, but it is better to use in the program dimensions a bit exceeding the real dimensions for the reasons mentioned above. The app is easy in use – you just have to enter the required numbers into the boxes and you will get the prompt result. 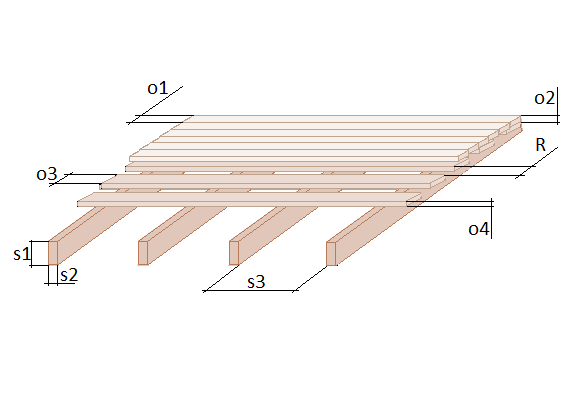 This tool does not give the approximate price but it provides with the approximate figures of floorboards and subfloor materials amount and number of rows. R — Spacing between boards. amount of the wooden beams needed for the subfloor. No doubt, the wooden floor is one of the best options for the flooring as it is natural material and does not need frequent replacement because of long-lasting durability. The hardwood floors can last for decades and it always looks stylish. The wooden floor can be sold in two types: a solid wood and engineered wood. The latter is not complicated in installation. As the presented wood floor calculator estimates the needed amount of flooring materials, every one can evaluate the volume of work and get the preliminary price before the floor installation. But there is only one remark – the wood floor is expensive: both the material, as the most common hardwood used is oak, maple, walnut etc., and the installation, because you need a skilled staff to deal with the installation. The cheaper alternative is the laminate. At lower price, you may benefit all its advantages like durability, stains and scratches resistance, versatility, its beauty and style. Before ordering the laminate flooring you also need to know the amount of laminate blocks and the amount of the materials needed for the subfloor and insulation. Note, that this online software also can be used as a laminate floor calculator too. © 2015 JustCalc.com. All rights reserved.